Telstra customers may notice a boost to their mobile phone service this week, but the best is yet to come. The company switched on its 5G technology for the first time today (Wednesday) in Canberra at its Canberra Airport North base station in Pialligo, with other sites coming online tomorrow (Thursday) at Phillip, Lyons and two sites in Fyshwick. Sites in Adelaide and Perth were also switched on. And while 5G handsets aren’t yet on the market, owners of 4G devices will notice a faster broadband service, particularly with content-rich data. 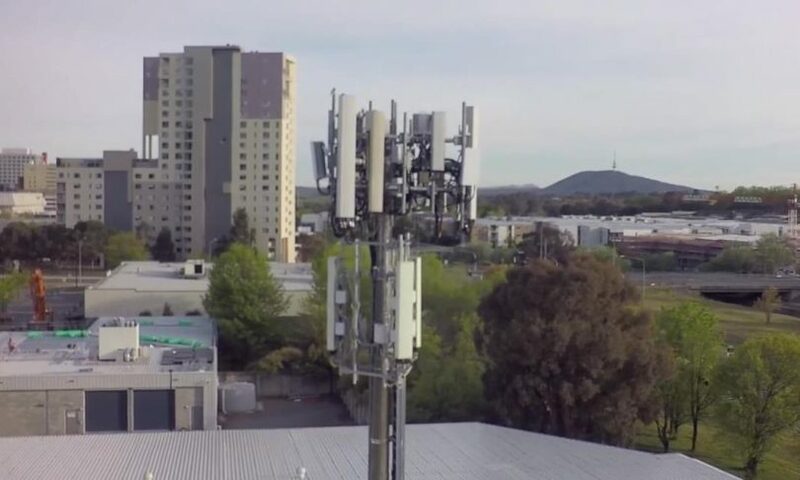 Regional General Manager for the ACT and Southern NSW Chris Taylor said the 5G network bonded with Telstra’s 4G network so even people on 4G would notice a better experience when they’re roaming on those particular towers. 5G handsets won’t be available for another 12 months but Mr Taylor says users can expect much faster broadband speeds and a lot more capacity for volume of traffic on the network. “You’ll notice the experience when you’re using content-rich data, when you’re streaming content. There’ll be better reliability on the network,” he said. But 5G’s real potential is with the “internet of things”, allowing millions of devices to be connected and being able to talk to each other. Mr Taylor said 5G’s lower latency and faster reaction times would allow things such as driverless vehicles to be realised. “Now we have a lot of handsets which people can browse the web on and do things but in the future, everything will be connected – vehicles, refrigerators, all of those sort of things. That’s what the next wave of networks is going to enable,” he said. Mr Taylor said the national capital was at the forefront of Telstra’s national rollout, with more sites to be switched in the coming years. Telstra is aiming for 200 5G sites across the nation by Christmas. “Canberra being the national capital is certainly attractive to us, but also the amount of innovation that happens in Canberra as well is attractive. We know there’ll be some good use cases generated just through the innovation that happens in business and industry and government in Canberra,” he said. The Canberra upgrade coincided with Telstra announcing Ericsson as its key 5G partner under an agreement that will see the two companies deliver the next generation of mobile technology for Australia. Telstra announced in August that it had started switching on 5G technology, making what it says is Australia’s largest and fastest mobile network the first in the country to be 5G ready. It said the rollout of 5G was underpinned by about $5 billion in mobile network investment over the three years to 30 June 2019. In February, Telstra launched its 5G Innovation Centre on the Gold Coast supported by Ericsson, which has since been home to several world and Australian firsts including the world’s first precinct of 5G-enabled WiFi hotspots, Australia’s first 5G Connected Car, and the world’s first end-to-end 5G non-standalone data call on a commercial mobile network. Telstra CEO Andrew Penn said Telstra had a history of investing ahead of the technology curve to ensure it had the latest capabilities in place to serve its customers. “We’re proud to partner with Ericsson to pioneer 5G technology in this country and to ensure that together we continue to deliver market-leading innovation in networks,” he said. I suspect that they have significantly upped the backhaul to those towers as part of the upgrade. This will be the point of difference with 5g, not the handsets themselves, but that they are upgrading backhaul to towers as part of that process. The Telstra network is getting smashed thanks to all the fttn dropouts, with peoples modems reverting to the 4g backup, or going to mobile data themselves off their phones/hotspots. "Telstra says owners of 4G devices will notice a faster broadband service, particularly with content-rich data." They also say They have great customer service, and we all know how that's a lie. Pfft. I’m lucky to get one bar of 3G in Macgregor on any given day, and that’s with Telstra! The only thing I have noticed this week is how poor my Telstra service has been. Best coverage I get is 3G!